Over the past 15 years or so I’ve been called on to judge a great range of foods. From critiquing prototypes of seafood dishes being considered for commercial production at the Symphony of Seafood, which I judged this year and about 14 years ago. To the far more playful Great American Spam Championship cooking challenge held at the Puyallup Fair each September (entry deadline is September 1 for this year, there’s still time! ), for which I was a judge a few years back. Yesterday had me on the spot again, helping judge the first annual Foster Farms West Coast Chicken Cooking Contest. Not only the first annual, but this was also the first of the three regional finals was held in Seattle, so we really kicked off the whole shebang yesterday. And in great style, at that, hosted by Kathy Casey and her team at the amazing Food Studios in Ballard. Kathy and I, along with good friend and colleague Jamie Peha from Table Talk radio, were the panel tasting and evaluating five finalists who’d been chosen from hundreds of entries from Washington state. All in all, over 2,o0o recipes were sent in from folks in Washington, Oregon and California. Those other regional finals are being held in Portland and Sacramento in this next week or so. From each region, the two top finalists will convene at CIA Greystone in Napa Valley for the super-primo finals in September, vying for a $10,000 grand prize and a one-year supply of fresh Foster Farms chicken. 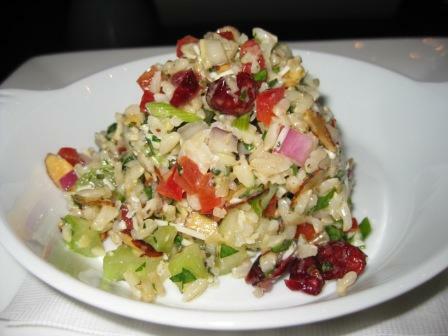 So there we were, sitting down at 10:30 in the morning with the first contestant’s recipe being served: Brown Rice Chicken Salad. May not be the most compelling of recipe names but the dish more than made up for it with great color, texture, flavor and a great use of common but fresh-and-delicious ingredients. The first dish is always the hardest to judge, as you might imagine. After all, they’re not really being judged in a vacuum. Inherently it comes down to comparisons as you eventually witness the style and flavor profiles of other dishes to come. 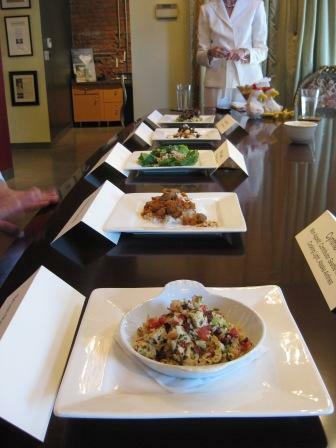 But after all was said and done and tasted and considered — that first taste of rice mixed with vegetables, almonds, Parmesan cheese, herbs and dried cranberries was a stand-out and one of the two finalists for the day. Bravo, Marci Adelsman from Kent! The other finalist moving on to the West Coast finals next month is Monica King from Vancouver, Washington. 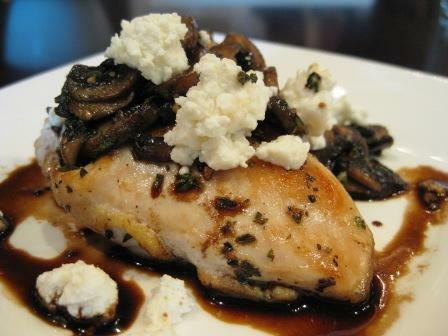 Her Balsamic Mushroom Chicken with Honey Goat Cheese was deceptively straight-forward looking. But it had a wonderful balance of flavors–tart balsamic with cream goat cheese, savory mushrooms with a touch of sweet honey–that showed off a standard skinless, boneless chicken breast in style. Just the kind of recipe that home cooks love: simple to make but with a great “wow” factor that dinner guests will relish. Cheers to Monica and Marci for their creative and flavorful dishes. Congratulations on your regional wins and best wishes to you both for the finals! Most of all, have fun. I’ve been on a granola spree lately. And it kind of took me by surprise. Well, to be true, I do remember this moment: on a business trip a few months back, I was on deadline working in my hotel room through the breakfast hour. I usually find room service menus pretty uninspiring and fall back on what seems safe and easy. That day, as on many others like it, I chose yogurt, fruit, granola. Sometimes it’s “yogurt and fruit” with a side of granola. Or “granola and yogurt” with a side of seasonal fruit. But it’s rare that some incarnation of that trio isn’t on a hotel room service menu. Safe. And easy. So there I sat, looking down at my now-predictable hotel room breakfast. And realizing how much I liked it. And wondering why it was that I only eat it while typing away on a borrowed desk out-of-town rather than on my own dining room table at home. Every now and then I think about picking up some granola at home. But most pre-made granola available at the store can be pretty insipid and lackluster if not also overly sweet. And the stuff that looks really great and homemade? Seems to always be about $5 per cup. Homemade, you say? Yeah, I’d done that before. Probably exactly twice. Recipe testing. The first, for my first book Northwest Best Places Cookbook, a “Nutty but Nice” recipe from the Marquee House in Salem, Oregon. (Looks like the recipe didn’t make the cut for the re-issue of that cookbook last year; the original came out in 1996.) 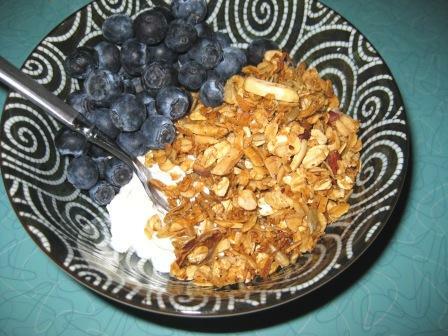 Another granola recipe from Rock Springs Guest Ranch in Bend, Oregon for another Best Places cookbook in 2003. Those Oregonians, they do love their granola! A popular item on many a bed and breakfast morningtime table, no matter what state. Since then, no oats had been tossed with melted butter and honey. No pan of healthful grains toasting in the oven to make a nutty and delicious breakfast food. Not until that recent enlightened morning when I realized how much I actually like the stuff. Granola is an ideal template for variation. If you’ve got wheat germ on hand but not flaxseed, swap them out. Neither? The granola’s just dandy without them. Nix the coconut, add raisins, use different nuts. Banana chips? Whatever floats your boat. It’s a fun and tasty recipe to play around with. 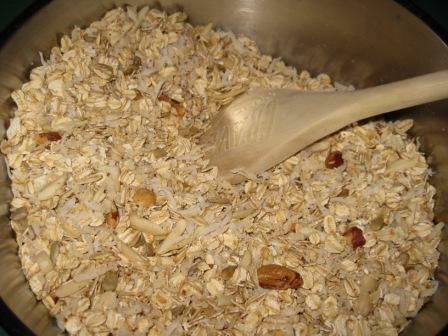 Stir together the oats, hazelnuts, sunflower seeds, coconut, almonds, malt powder and flaxseed in a large bowl. Combine the butter and honey in a small saucepan and warm over medium-low heat until the butter is fully melted, stirring occasionally. Stir in the vanilla, then pour the butter mixture over the oat mixture. Stir well to evenly blend, then pour the oaty combo out onto a large rimmed baking sheet or baking dish. 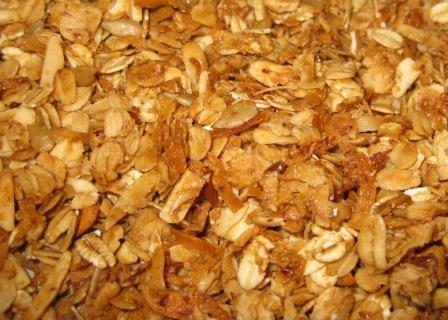 Bake the granola until lightly browned and toasty-nutty smelling, about 1 hour, stirring the granola gently every 15 minutes or so to assure even cooking. Set aside to cool thoroughly before transferring to an air-tight container for storage. The granola will keep for up to 2 weeks, in a cool, dark spot and well sealed to keep it crisp. Okay, enough with the stone fruits! I’ve clearly been on a bent about that category of delicious summertime fruits. For a moment I’ll move along from the peach and plum tones of those juicy treats and give some props to the jeweltone berries. A few occurrences conspired to put visions of summer pudding dancing in my head over the past few weeks. Random conversations. Memories. What-to-do-with-those-beautiful-berries ponderings. The last straw was when I came across this recipe in Relish magazine a couple of weeks ago. That did it. Summer pudding it would be. Friends coming over for dinner a couple nights later were to be the victims. 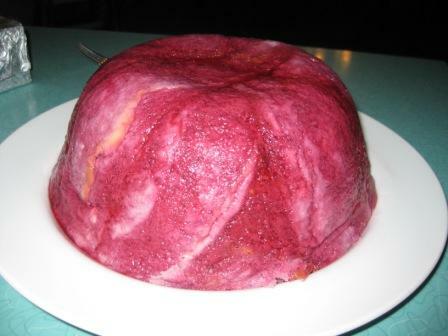 I first learned about summer pudding about 20 years ago. At the time I was living in France, working on various book projects with Anne Willan after having graduated from La Varenne. One interesting project had me going over to England with Chef Claude to do some video work, done at the English countryside home of one of the project’s producers. Beautiful setting, warm and gracious people, quiet environs. It was a wonderful few days. A highlight of which was a small dinner party our hosts threw while we were there. The time was late summer, I can still picture the cozy, colorful dining room and lively ambiance of conversations that evening. Not every detail of the meal remains in my memory bank, but I was introduced to two things that night: sea beans and summer pudding. Sea beans (also known as samphire, among a number of nicknames) will have to wait for another day. But that summer pudding was a revelation: bright and bursting with flavor, despite being made with little more than berries, sugar and bread. Off I went to the grocery store, my wonderful neighborhood West Seattle Thriftway that feeds me so well. This time of year they have a special rack in the produce area, featuring berries from Sakuma Brothers up in the Skagit Valley. Sure, expensive when you compare the price berry-for-berry against the standard offerings. But worth every cent given the mountains of flavor and aroma they offer by comparison. A quart of strawberries, a pint each of blackberries, raspberries, blueberries, boysenberries. 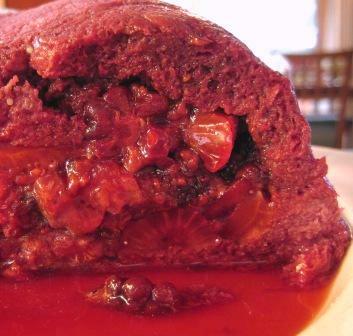 Though I always knew summer pudding to be made with everyday white bread–a type with dense crumb and not too soft–I wanted to make mine with brioche for a bit of extra panache, as did chef Ashton in that Relish recipe. There’s a good selection of Macrina breads at my Thriftway but that day the brioche loaf came only in raisined form. Not for summer pudding. So I made perhaps an odd choice and went with Macrina’s brioche hot dog buns. Same product, different shape. Just meant a bit more creative shape-cutting to fully line the bowl. I didn’t follow the recipe exactly, as is my habit. I used less water, maybe 1/2 cup. I didn’t strain the berry juice from the berries to then dunk the bread pieces in the juice. Seemed an unnecessary step to me, dirtying more tools, when the bread is going to have ample time to soak up all that juice once the pudding is assembled. So there I was, lining a ceramic bowl with my oddball shapes of brioche buns. I cut off most of the crust and cut the buns in long slices to best replicate normal sliced bread. Gently cooked the berries a bit, then ladled them and their vivid juices into the bowl. More brioche on top. Then the perfectly-sized plate to perch on top, with a heavy can or two to weigh everything down while it chills for a good 8 hours. It’s pretty phenomenal how much that loose, juicy berry mixture sets up over time. Thankfully, the plastic wrap used to line the bowl gives you some leverage to help neatly dislodge the pudding onto a serving plate. A friend with Anglo heritage swears Devonshire cream is the only ideal accompaniment to a “summer pud” but all I could muster up was some freshly whipped and just lightly sweetened cream. Perfection. A great way to cap off dinner with a longtime friend passing through town with his two bright, precocious children. And it wasn’t bad for breakfast the next day, either. I have got to make a point of getting to Vessel sometime in the next week or so. 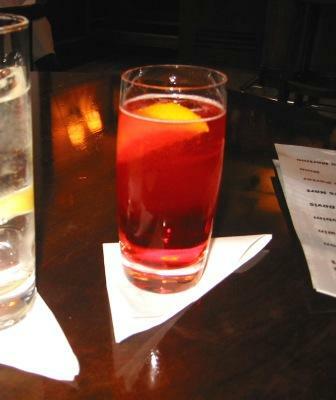 Just got an email reminder that they’re celebrating one of the most venerable drinking establishment in the world–Harry’s Bar–with signature items from their menu (beef carpaccio was created there, so the legend goes) and the quintessential Harry’s libation: the Bellini. A trip my husband and I took to Italy in 2007 included two major pilgrimages for me. One to the Via Tribunali in Naples (the street after which this Via Tribunali was named) and the other to Harry’s Bar in Venice. The trip came PB (pre-blog) but I briefly recapped the excitement of cocktails and pizza on my then e-newsletter. My very first trip to Venice had been back in 1985. It was an amazing, inspiring, eye-opening couple of months traveling eastward as far as Istanbul after a semester of study-abroad in Dijon, France. My girlfriend and I had a budget in the roughly $10-a-day range, stayed in cheap-o pensiones and spending as little as possible on food and other indulgences. “Quanto costa una camera per sta sera?” I’d ask into the payphone at each subsequent train station, checking affordability of a room from a listing found in the Let’s Go Europe book. We got berated by a waiter in some restaurant in Venice, having ordered a pizza that we wanted to share; he made it clear pizza’s were NOT to share, instead we had to each order our own. But budget or no, it didn’t keep our Venice visit from being magical. Rich is every single traveler who gets to cross the myriad bridges arched over the canals. Getting lost in the small twisty lanes that dead-end to yet another canal. Squinting your eyes in Piazza San Marco and pretending it’s 100 years ago. We watched the sleek, romantic gondolas slip past with a sigh. That few days did, however, leave me with one lingering desire. One that my husband had heard me repeat a few times over the years when the subject of travel to Venice came up in conversation. My wish was to return some day to the glorious city with two things: a man and a credit card. About 22 years after that first visit, I got my wish. Funny thing is, after all that, we never did invest in the iconic gondola ride. Better ways–it ends up–to spend one’s money in Venice! 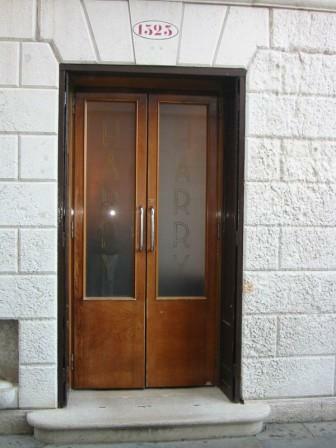 On that first trip, Harry’s Bar wasn’t even on my radar. Didn’t register as something to dream longingly about for a future visit. But over the years, I did hear and read about the place, its history, the colorful and iconic characters that passed through that glass-paneled doorway. Though I swear that wasn’t the ONLY reason we chose to book a cruise that began and ended in Venice, it sure was a lovely side benefit of the decision. And it meant I got to Harry’s twice, once on each end of the trip. So there we were, slipping into one of the dozen or so tables in the bar, actually at Harry’s. Just as Ernest Hemingway, Truman Capote, Orson Welles, Peggy Guggenheim and many others had been. I didn’t care how simple the decor, underwhelming the physical nature of the place. It was a moment to enjoy, feeling generations of characters sitting alongside me. But I wasn’t about to order a Bellini. For one thing, I never much enjoy a fruity drink. And for another, I hate ordering what everyone else is ordering. I tried to squint while sitting in Harry’s and imagine I was there 60 years earlier with locals and arty expats and nary a tourist in site. But it didn’t quite work. Took so much squinting that my eyes were effectively closed. Truth is, by my count a good 75% or more folks come in, order one very expensive Bellini and head off for one of those even more expensive gondola rides. I opted instead for a Negroni. Gin, Campari, sweet vermouth. Italian, though not from Venice. Far more my speed. Had a couple for good measure. 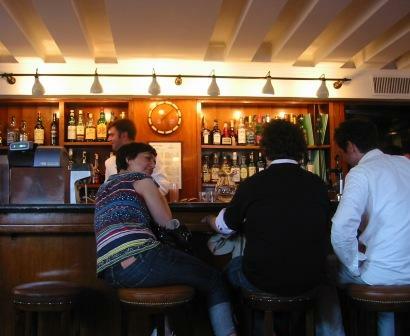 And to justify more people-watching and daydreaming and just reveling in being in such a historic watering-hole. One item marked “done” off the great life list of culinary to-does. Two when you count that pizza in Naples! Here’s to a lifelong pursuit of a delicious lift list fulfillment.